We’ve boiled down the guidelines to their simplest form. 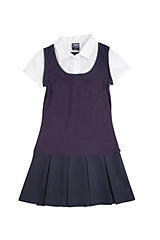 Old Navy, Target, Walmart – your basic big box stores all carry school uniforms. White, light blue, Peabody blue, navy dress shirt with collar (Yes, that means polos, too). White, light blue, Peabody blue or navy blue blouse with collar (this includes polos). Light jackets, sweat shirts, cardigans, sweaters, or vests may be worn; however, they must be solid white, light blue, Peabody blue or navy. Heavy coats may not be worn during the school day. No denim material may be worn. T-shirts worn underneath a shirt should be white. Peabody School color: Peabody students can also wear their school color –Royal Blue! So shirts and jackets can be worn in this color as part of the regular school uniform. Save Some $ for Official Peabody Shirts: The PTA will be selling our super awesome Peabody logo shirts and hoodies. We’ll notify you when shirts go on sale, so watch your school folder and signup for our emails and follow us on Facebook! Are black shirts ok? We wore them last year. Hi! I emailed Principal Nelson and she said black shirts are not part of the dress code but black pants are fine. Sorry for any confusion. I hope this clears it up!